Designer tapas - another trend? 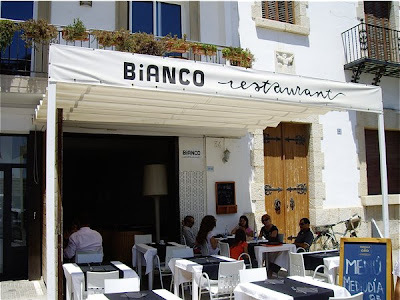 Well I do not know, but the closest encounter I have had with trendy tapas took place at Bianco Restaurant in Sitges in June. 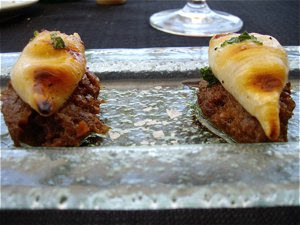 It was a far cry away from garlic shrimps or spicy sausages once served in noisy bars throughout the Iberic peninsula. Here you had the traditional stuff with a twist, at least the calamaris. Bianco is located by the main beach, not far from the church. Here you may enjoy trendy food facing the Mediterranean, and I did just that at lunch time June 20th. I was not very hungry (I had a little more than usual for breakfast), so I decided to try two tapas. That was a treat, but it was expensive. Close to €20 for the meal with wine was expensive, but the tapas were fab!! This was truly an original twist to the traditional calamaris, that are rolled in batter and deep fried. No excess fat here. Two squid, no tentacles, quickly fried and served on an extremely aromatic onion stew. Delicately balanced, and the truffle aromas, distinct but discreet in the background. What about a truffle risotto from Piedmont? 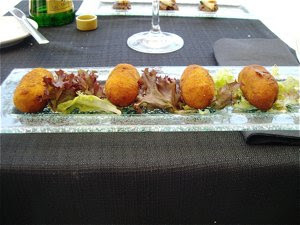 Sorry more croquetas, they are my favourites and I eat as much as I can while being in Spain. The specimen served at Bianco Restaurant looked as any other served during my week in June, but they were definitely better, packed with all those yummie jamony tastes. The designer element was a square glass plate and lettuce to improve digestion. And what to drink? Dripping cold rosé wine, delicious to meat as well as fish - a perfect choice in the hot weather. Restaurant Bianco was expensive, but they served delicious, delirious designer tapas.